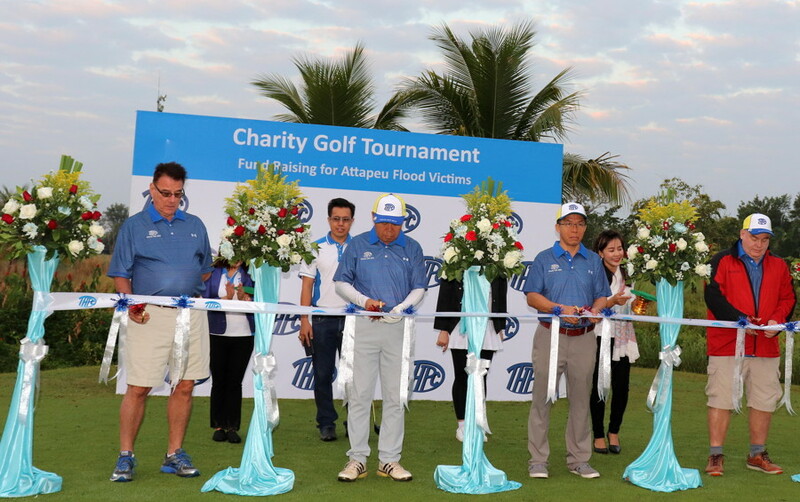 Theun-Hinboun Power Company (THPC) held its annual Charity Golf Tournament at the Long Vien Golf Club on Saturday to raise money for the thousands who lost their homes in July’s flood in Attapeu province. More than 60 golfers attended the event. Their efforts and generosity meant the company’s target of 60 million kip was far exceeded, and by the end of the day 100 million kip had been collected for donation to those who suffered in the flood. On behalf of THPC’s shareholders - EDL-Gen, SN Power and GMS International - company Chairman and Head of Office at the Ministry of Energy and Mines, Dr Daovong Phonekeo, welcomed golfers to the event. 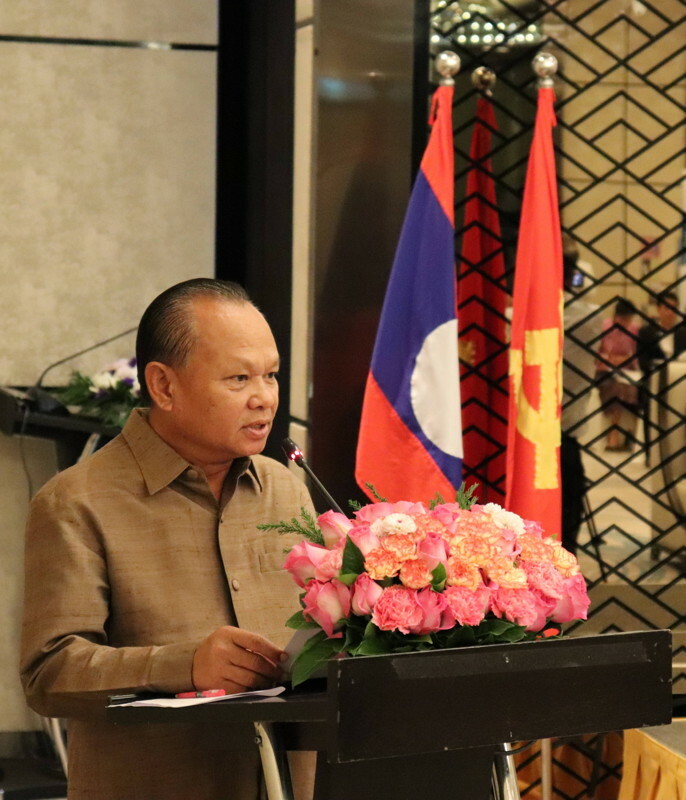 He said the tournament gave the various groups involved in Laos’ economic development the chance to meet socially and to strengthen their cooperation. All of the event expenses were covered by THPC, with each participant contributing 1 million kip to take part in the tournament. All of the money donated by the golfers will be handed over to support ongoing relief efforts in Attapeu province. 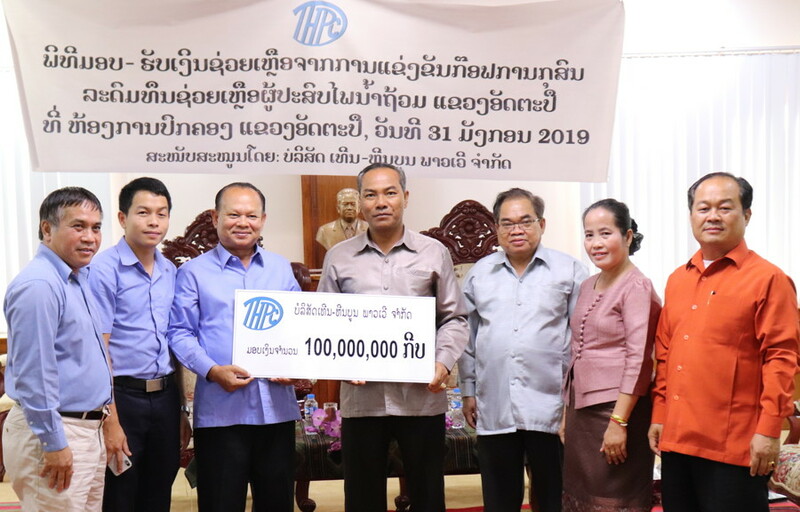 THPC previously contributed 300 million kip to flood relief efforts in the provinces through the Ministry of Energy and Mines and the Disaster Victims Assistance Fund at the Ministry of Labour and Social Welfare. THPC operates the Theun-Hinboun and Nam Gnouang Powerhouse in Khammuan and Borikhamxay provinces, with a combined capacity of 520MW. THPC is the only independent power producer that is majority Lao-owned and 97 percent of its staff are Lao nationals. The company’s business covers not only power production, but also innovative and wide-ranging social and environmental programnes across five districts in two provinces. THPC has contributed over US$580 million to the state since beginning operations in 1998. Results: Xayying Tongyertor lifted the trophy after seeing off other contenders and coming first in the Overall Low Gross and Low Gross score categories, while Thongsavanh Keokhounying won a cup with first place in the Overall Low Net category. Note: The 100 million kip raised was handed over to Attapeu provincial authorities on January 31, 2019. 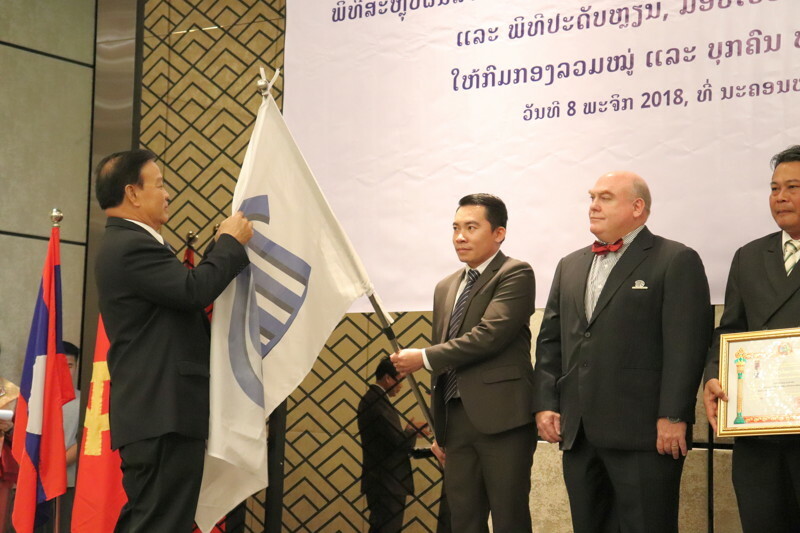 On 6 June 2018 the Lao Federation of Trades Unions (LFTU) presented its highest level of award to THPC in recognition of the company’s donations to the LFTU over the last three years. Each year THPC has made a donation in support of the LTFU's work on the occasion of International Labor Day. 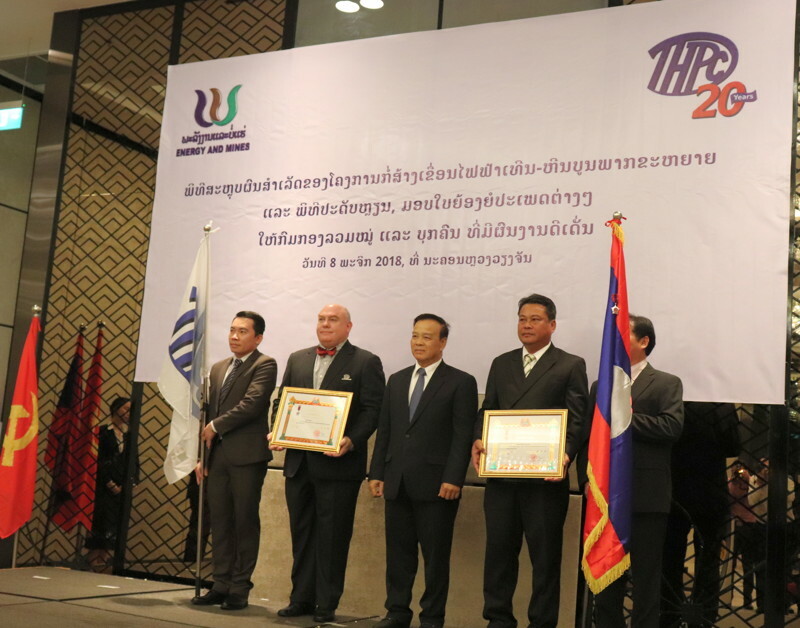 Presenting the Trades Unions medal to THPC General Manager Mr Robert Allen, Mr Phouvong Farkfueangchai, the Director of the LFTU Incentives and Awards Department, thanked THPC for its ongoing support and commended the company for its sustained performance. 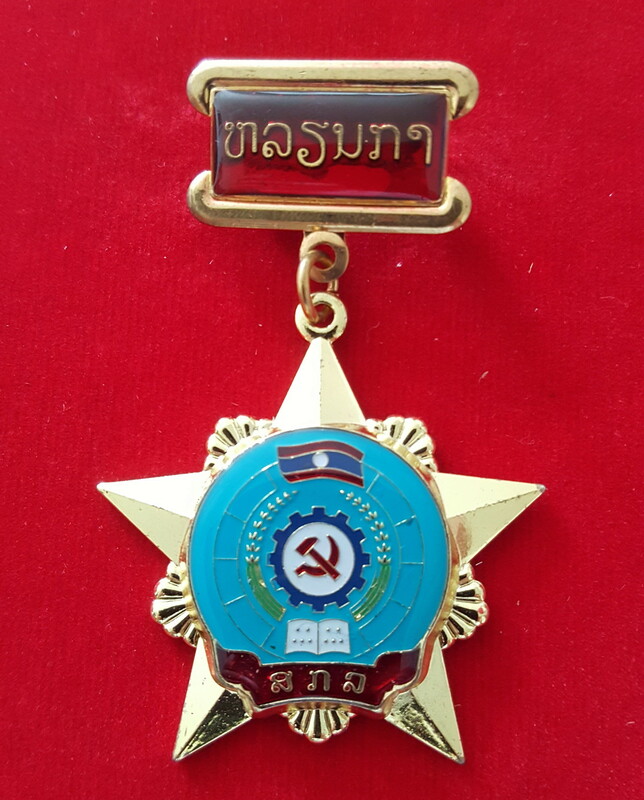 Mr Allen said THPC was honored to once more receive the Trades Union Medal and stressed that careful observance of workers' rights is a key foundation of company policy. Bounmee Phommalinh loves her job. “I like making beds and folding things – it’s very satisfying”, she beams. Some might think her work, as a house-keeper at guest rooms on the Theun-Hinboun hydropower site in rural Laos, to be limited or unambitious. But 22-year-old Bounmee, a bright and bubbly character, is very enthusiastic. “There’s many different aspects to a successful guest house”, she explains, “lots of tasks that should be done perfectly. With training, practice, patience and experience you can achieve this, but you have to work hard”. 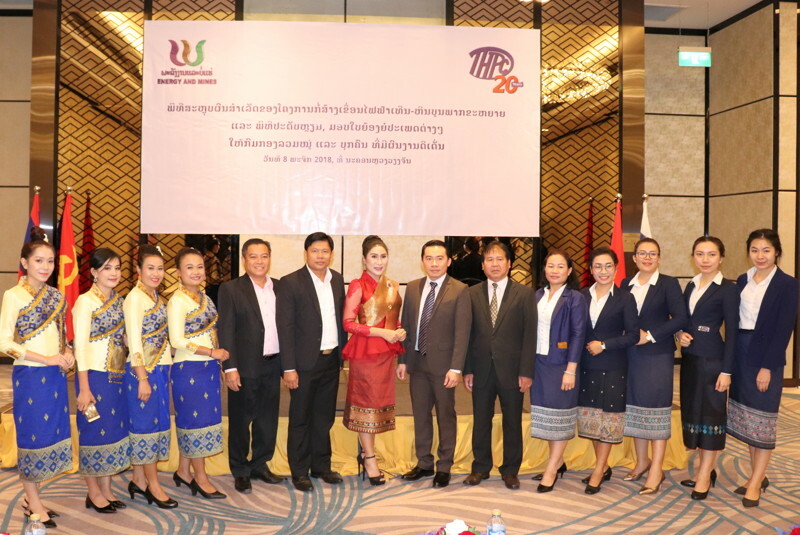 These are not the words of a casual worker, but the thoughts of a dedicated professional who completed two years of training at the Lao National Institute for Tourism and Hospitality, or Lanith, following a scholarship awarded by the Theun-Hinboun Power Company (THPC). From Khounkham district in Khammouane province, the location of the Theun-Hinboun Powerhouse, Bounmee grew up next to the hydropower project, which was under construction when she was born. At the age of ten she enrolled at the Theun-Hinboun Private School, which offers free education to the children of local families. “My family was poor”, recalls Bounmee, “so I was even given uniforms”. Bounmee remembers her school days fondly. Having friends who went to other schools, she was able to appreciate the quality of education at the THPC School. “The teachers were good”, she says. “They had a lot of skills, understanding how to transfer their knowledge and let each child develop individually”. At the age of 18 Bounmee finished her national high-school exams and applied for a THPC vocational scholarship, available for underprivileged children at the company school. 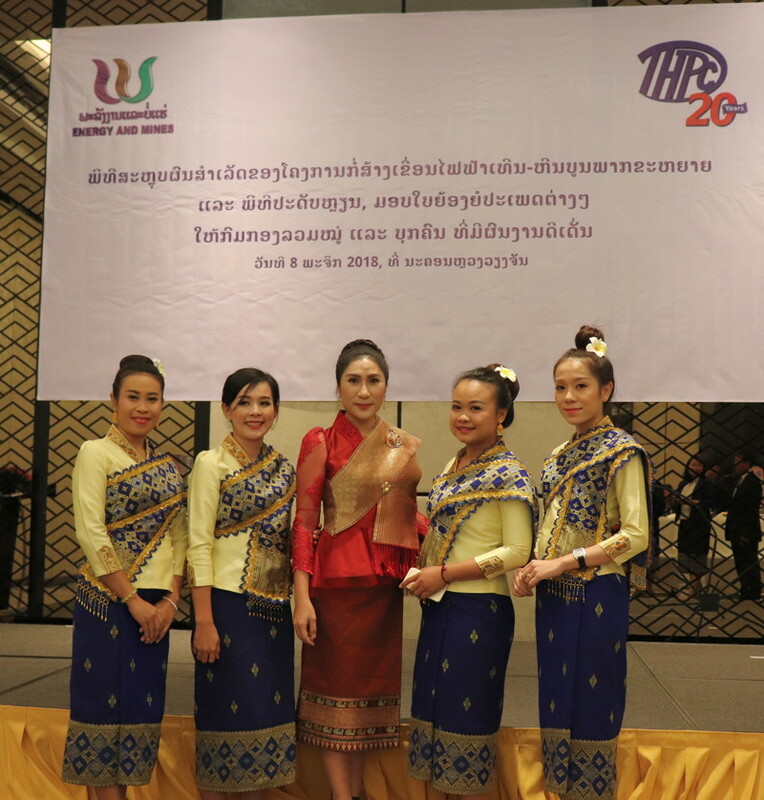 She was one of two pupils selected for the award, which offered places at Lanith in the Lao capital, Vientiane. “I had never been to Vientiane before and was so excited,” she remembers. “There were a lot of new experiences for me, going to a big city so far away.” There were also many challenges, but the scholarship included a monthly stipend from THPC and support from company staff in the capital. They gave Bounmee textbooks and stationery, and knowing that she could always call them if she needed was a great help. She was able to live frugally as a student, saving some of her allowance each month in order to help her family. At Lanith, Bounmee chose a diploma in Accommodation Operations, including courses in tourism and hospitality, communication and computing skills, English, housekeeping, and business management. She especially enjoyed the housekeeping course, which taught practical skills and provided the opportunity to work and learn alongside fellow students. In her first year she completed a month’s work experience at a resort in the tourist destination of Vang Vieng, and the next year she was an intern at a high-class hotel in Vientiane. These stints not only taught her about working under real-time pressure, but also paid well. The THPC bursary is a tied scholarship, meaning the students are obliged to work two years for the company following their training. Bounmee says she understood this when applying for the scholarship. How does she feel about it now, when she could easily find work in the city? “I’m so happy to work at the THPC camp,” she replies. “My house is nearby and I’ve missed being home. Some other pupils from the school won scholarships at a higher level, to study at university, but they weren’t lucky enough to get jobs with the company”. The THPC guest house hosts around 170 visitors per month, mainly contractors, government officials and head-office staff coming to site for meetings and work. Bounmee arrives at eight o’clock each morning to meet the manager and team for daily planning. She then works in the laundry, folding and finishing all items washed the previous day before returning them to the guest rooms and cleaning each room. She works with speed and precision, taking less than ten minutes to turn around each double room with en suite bathroom. Her efficiency makes skilled tasks like bedsheet cornering and towel folding look simple. Education has given Bounmee confidence and ambition. “I’ve been given an opportunity to improve myself and earn a steady income,” she says. “Without the THPC School and the scholarship, I would be labouring in rice fields, doing harder work for less income. Now I’m saving money for the future. I want to improve myself and one day run a housekeeping service that trains people and is used by many companies. Maybe then I can offer opportunities to local people, like THPC does”. 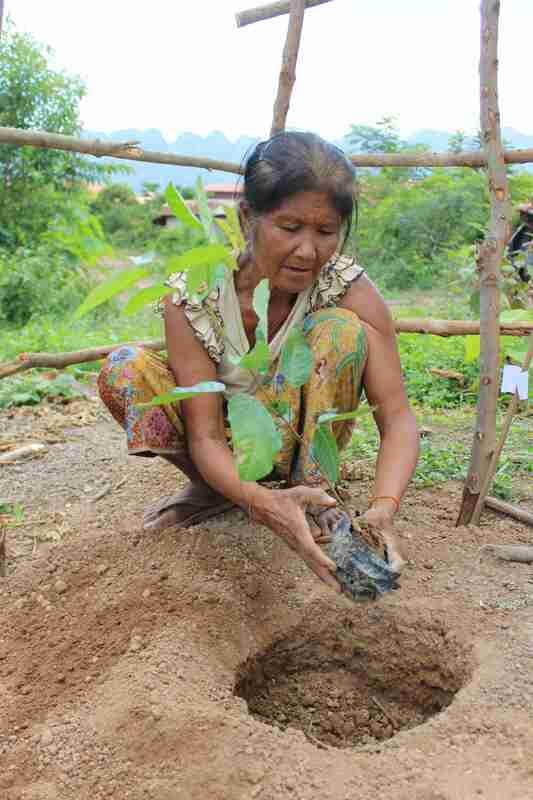 Marking National Tree Planting Day on June 1, Phaxang villagers came together with staff from the Theun-Hinboun Power Company (THPC) to plant trees and increase the amount of green in their community. THPC provided 2,000 saplings, including fruit, ornamental and plantation species. The saplings were distributed to households for planting in their house areas and in public places such as the village school, temple and health centre. THPC technical staff also gave the villagers instruction on how to plant and take care of the trees. Each year the company selects one village for tree planning efforts in the area around its power plant, organizing an event with local authorities to mark National Plantation Day and World Environment Day. Mr Soulideth Baomanikhoth, Deputy General Manager of THPC said that “trees planted today will increase abundance for the community in future, providing shade and fruit for villagers”. Phaxang groups five small communities that were formerly in Hinboun District, and was built by THPC as compensation for longer annual flood periods. The Theun-Hinboun hydropower expansion project, inaugurated in 2013, intensifies natural flood cycles on the Hinboun River, so THPC built new houses and public facilities on higher ground for villages along the river.